A Popular Travel Blog Focusing on Pennsylvania and the United States. Established in 2008. Come Take a Journey with Us! 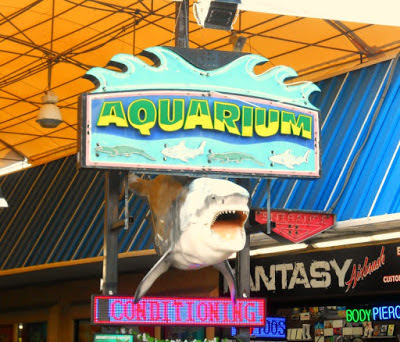 If you're going to be visiting the Ocean City, Avalon, Stone Harbor, Wildwood and/or Cape May areas in New Jersey, you'll want to stop in and visit the Seaport Aquarium, located on the Wildwood Boardwalk. To enter, you'll have to go up onto the boardwalk in the 3400 block area. You'll find paid-metered parking and paid parking lots nearby. During the summer season they're open from 10 AM to 10 PM every day. You'll pay your admission and purchase your ticket right before you enter their facility. If you're trying to escape the heat for a few hours, you'll find air conditioning inside. 10 to 12 years ago we visited this aquarium for the first time and weren't really impressed with it. Over the years...we've just avoided it. However, we heard that over the past 3-4 years that they really worked on improvements to their facility and added some new animal species to their collection. That peaked our interest for a return visit. As we were paying our admission to enter the aquarium they had a real Python outside and were letting visitors pet the snake, while giving them some information about Pythons and their facility. At first...my little granddaughter was afraid of the snake, but the handler (staff) really reassured her that it was perfectly safe to pet it. The staff is really knowledgeable and patient with kids! Thankful for that! Once inside you'll find a wide variety of animals on display. We saw all kinds of different tropical fish in beautifully set-up aquariums, turtles, sharks and other marine life. There is a "touch tank" where you can stick your hands into the water and touch the fish which was really cool. There are over 16,000 gallons of fish on display with fresh & saltwater species from around the world. You can visit their 6,000 gallon coral reef exhibit that houses the most beautiful & exotic species in the ocean. There are hundreds of different fish to see including: puffer fish, lion fish, piranhas, clownfish, sharks, koi, triggers, tangs and more! You won't be disappointed with what you see. My husband is a huge reptile fan and was impressed with their reptile collection. He enjoyed seeing the Leopard Gecko, Black & White Tegu, Blue Tongue Skink, various lizards, snakes, etc. His favorite to see were the two large alligators named Wally and Brutus. What was my favorite animal to see? Hands down...my favorite was the pair of Coatimundi. I believe they're sisters named Thelma and Louise! They're absolutely adorable! You can tell that these two are playful and enjoy one another's company. I could stand there and watch them for hours! The next time your down to the Jersey Shore, make sure you stop in and visit. If you haven't visited them in awhile, trust me...they have greatly improved! We will be visiting them every time we're down in the Wildwood area. The Seaport Aquarium is really active on their Facebook page and post updates almost daily. You can connect with them on Facebook for updates, specials, etc.